I've been on the look for quite awhile for a simple, everyday tablecloth for my round dining room table. I have several tablecloths that I use for company when I have the table pulled open to its full length. And I even have some very favorite vintage tablecloths that fit it when it is closed to the round size, but they are vintage and special and I don't really like using them for everyday. I was totally fine sewing it myself, but the problem is that I didn't really find the fabric that was what I had in mind. And I was set on something Farmhouse! 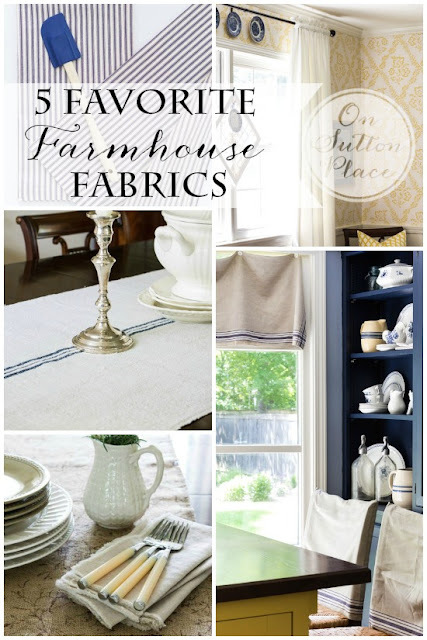 About a month ago, a blogging friend wrote a post entitled, "Five Favorite Farmhouse Fabrics". My daughter read it first and called me to tell me to look at it. One of the fabrics she talked about was grain sack, which was exactly what I was wanting. But have you ever priced the real grain sack fabric on ebay? Pretty much way over my budget for a "use everyday" tablecloth! But this fabric, offered through Decor Steals (here), is a reproduction. And it is totally perfect! It comes in blue, red, or tan stripes. I chose tan because I wanted it to blend with the colors in my dining room curtains. It also goes very well with the shades on the light above the table. The fabric is a nice weight and the texture is very much grain sack! It's actually kind of hard to believe it is a reproduction. The fabric comes in 3 yard lengths, which is the perfect length for an eight foot table. The long edges are finished, so all you need to do is hem the ends. Since I wanted mine for the small round table, I only used 2 yards of the fabric, so I'm excited to have a yard left for another project. The very best thing of all? Stains come out so easily and it doesn't need ironing! Straight from the dryer to the table, wrinkle free! My favorite kind of tablecloth. It fits just fine with my modern, bright colored Fiesta Ware dishes. And with my vintage 80's Fiesta Ware. It's totally perfect and I love it. Wow! How did I miss a Monthly Moos post in June? Could it be because of this... our flower garden? Keeping us very happily occupied? 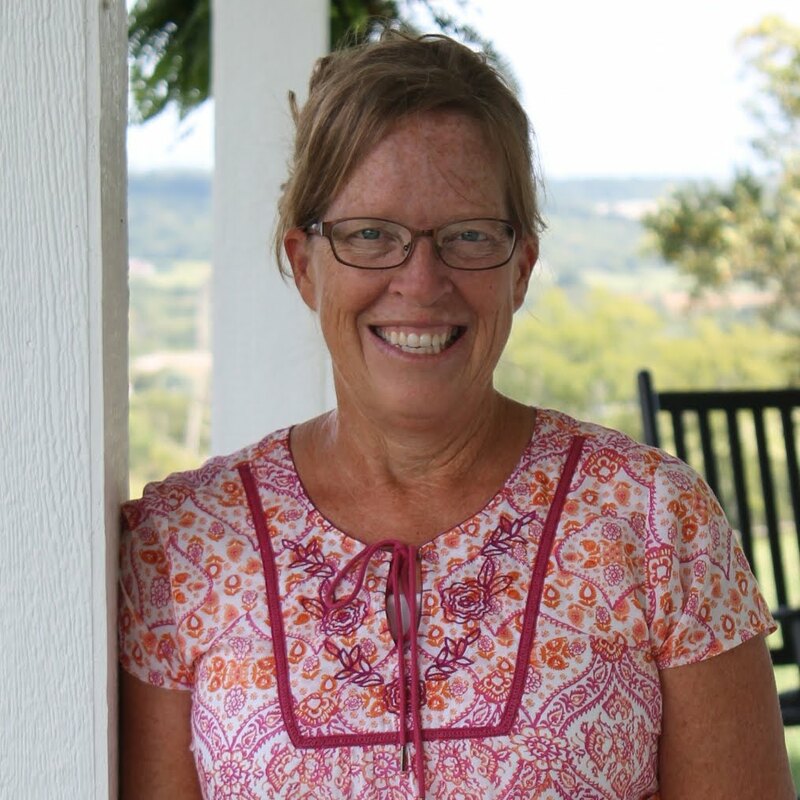 I shared with you last year in July about our little honor system farm stand (here) and the idea that my daughter and I were pursuing of growing cut flowers and selling on the farm stand. I don't think I ever let you know here on my blog how it actually went! Our little cart got all kinds of attention, the word spread, and before we knew it we were selling every bouquet we could make from our tiny little flower garden. We learned a lot about marketing our product. We came up with a great system for getting our bouquets from the garden to the flower cart without spilling even a drop of water! We got very good at whipping out 15 to 20 bouquets at a time. On a folding table in the middle of the garden! Summer passed and we decked our cart out for Fall and continued to sell flowers until the first freeze came the end of October. This winter my daughter and I had a long discussion about the next flower season. We had a big planning session where we decided to expand the size of our garden. We ordered our seeds, made a huge master plan of succession planting and what and when we would plant. Spring came and Eldon did the tilling and hilling. Justus helped with the layout. Andrea and I and the little girls did the planting. And the plants grew. And we weathered disappointments of no rain, infestation of Aphids, deformed Zinnias, weeds that grew right before our very eyes, and seeds that didn't come up. But the plants kept growing and beautiful blooms began forming. Eldon and Justus built us an awesome open air work shed so we can work on our bouquets out of the sun. And the little girls have a place to hang out and play while we are working in the garden. The boys help us by keeping the walk ways mowed and string trimmed. Andrea and I do the hand weeding in the rows themselves. We've learned the personalities of the many varieties of sunflowers and which ones work for bouquets and which ones don't. Our second succession of planting is up and doing well. The little girls play with bugs, butterflies and their dolls! And Belle, our farm dog, keeps all of us company. And every morning, when the dew is on the ground and the morning mist is still in the air, we meet at the flower garden to make the bouquets that fill our cart for the customers that keep coming to buy our beautiful flowers! We provide flowers for different events in the area and we even have a reserved box on the back of our stand for those that call ahead and place an order for the day. And all of this is operated on the honor system. I think it is safe to say that we really and truly are Flower Farmers. It is a joy to provide beautiful farm fresh flowers straight from our garden to the homes of people that love them. Someone recently asked us how we ever leave the garden. She said, "It would be my happy place and I would just live there". And we just about do!